Beryllium founder Beryl Diamond Chacon is a concert violinist and a graduate of The Juilliard School. Beryl studied Chamber Music with Earl Carlyss of The Juilliard Quartet and with the late legendary Josef Gingold. Early studies began with Eugene Phillips and continued at Juilliard with Sally Thomas. Beryl has played under the baton of Zubin Mehta, Sir George Solti and Bernard Haitink. 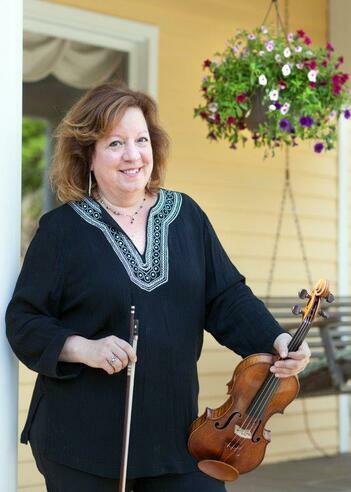 She performed as concertmistress in Avery Fisher Hall with her small chamber orchestra with James Earl Jones narrating, as well as performing at Lincoln Center's MidSummers Night Series, in Carnegie Recital and at The Treetops Chamber Music Series. Appearing as concertmistress and violin soloist, Ms Diamond Chacon conducted members of the London Symphony and the Royal Philharmonic playing a private performance for the Queen and other members of the Royal family. On Broadway, she began her career with The Royal Shakespeare Company onstage, nightly performing the Mendelsohn Violin Concerto. For twenty years, through Sept 2012, Beryl created, programmed and performed for The Met Museum's informal weekend chamber music on the Met Balcony. Beryl also created and managed The Guggenheim WorldBeat Jazz Series, which took place at the uptown Guggenheim Museum for seven seasons. She has recorded for numerous artists on the Columbia, BMG and Warner labels. These include Tony Bennett, Carly Simon, Katy Perry, Bette Midler and Billy Joel. On her own label, Beryllium Records, she has performed and produced "The Romantic Piano Trio", "OME: A Piano Quartet Sampler", and "Beryllium Performs The Chamber Music of Joe Gianono". All are available on CdBaby.com/Orion Music Ensemble/ Beryllium.